First of all, Merry Christmas everyone (even though it is a bit late)! 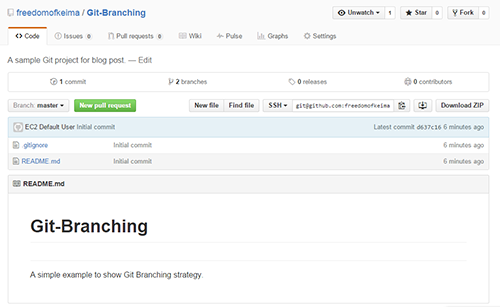 In this blog post, I want to talk about an introduction to Git branching strategy. The simple question before starting this post: "Have you ever said to yourself that Git in software development is a mistake?" If you're asking the same question to me, my answer is absolutely yes. I used to have a lot of bloody tragedies in Git, especially if the team has a lot of members. The problem may be caused by you or your lovely teammate, which made you to summon everyone in the room to fix the Git issue. 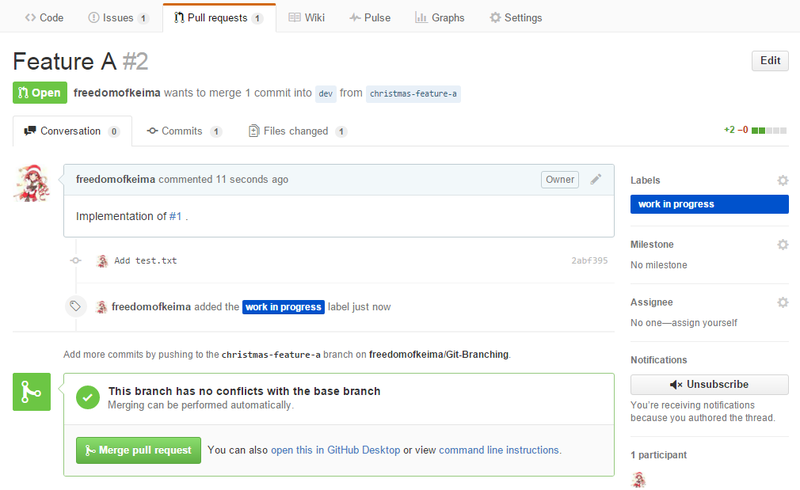 I will provide an example project in https://github.com/freedomofkeima/Git-Branching. Every great projects in Git start with git init. 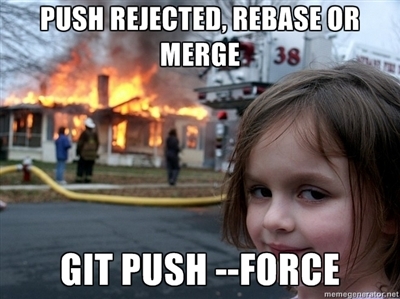 You will commit your usual "Initial Commit" and push your project to Git repository. At this point, you will be presented with master branch (origin/master) and you need to create a development branch, which will be named as dev branch (origin/dev). It is recommended to update your default branch to dev branch. Most likely, you will not interact with master branch until the next tagging/release. This dev branch will be used as your current HEAD in development environment, while the HEAD of master branch should be consisted of production-ready code. Let's say we have two team members, which are named by Maki and Saitama. Maki will develop "Feature A" while Saitama will develop "Feature B". 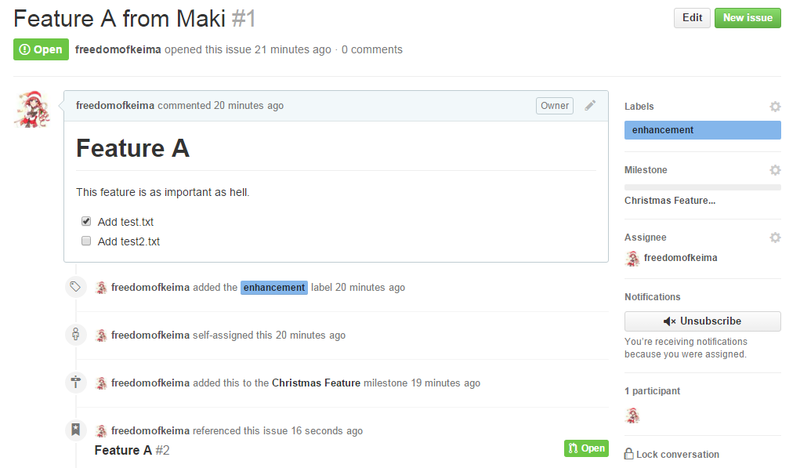 Maki decides to create a new Issue in Github, and set the due date to a certain milestone ("Christmas Feature"). 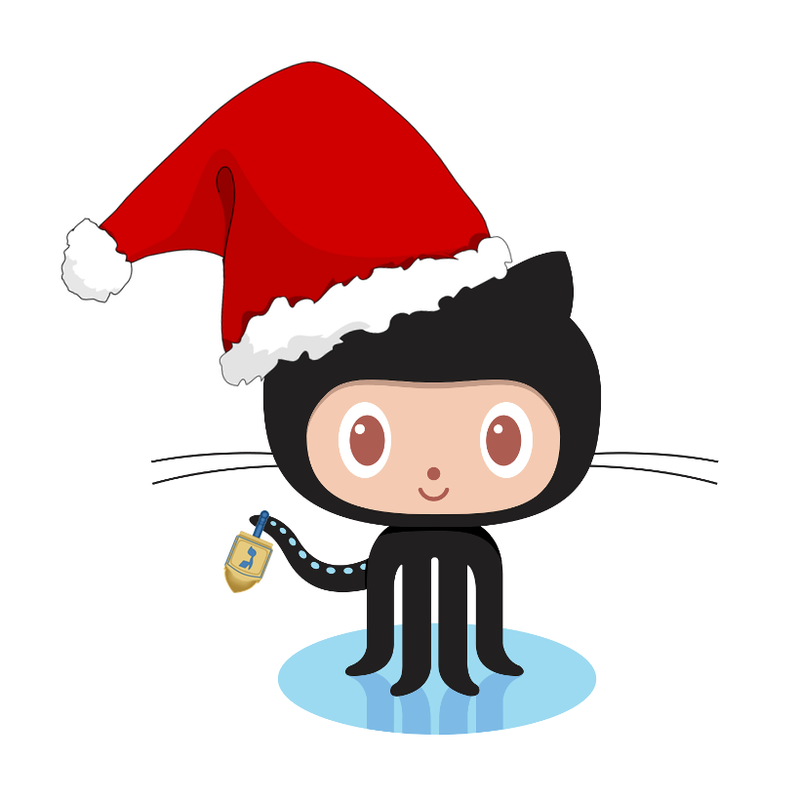 git add --all  # Add all modified and untracked files, it is recommended to check "git status"
git commit -a -m "Add test.txt"
At this point, you will have 3 branches in your repository: master, dev, and christmas-feature-a. 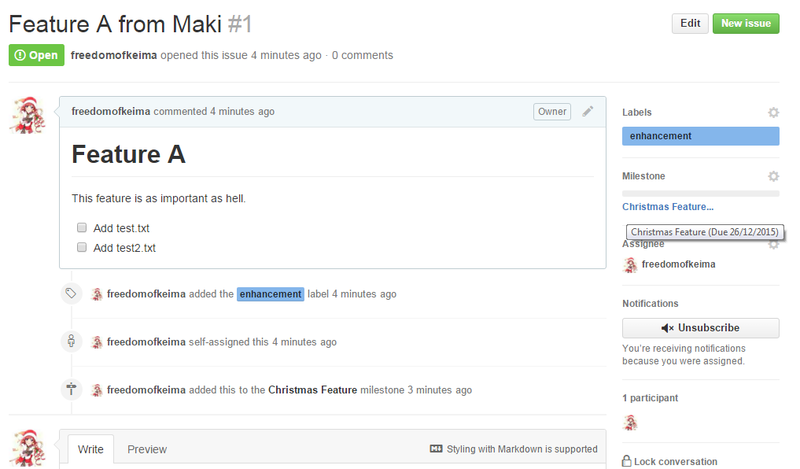 After pushing the commit above, Maki decides to go to America and creates a temporary pull request in Github (base = dev, compare = christmas-feature-a). In the same time, Maki puts a tick in "Issue #1" for her first task. git commit -a -m "Add test3.txt"
git commit -a -m "Add test4.txt"
Saitama decides to create a pull request directly from this commit. Maki reviews this pull request and she gives a LGTM message (Looks Good To Me). 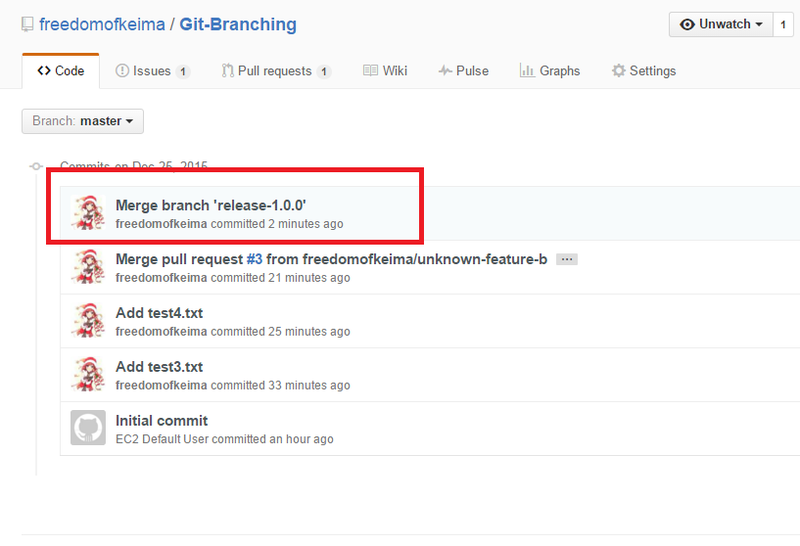 Saitama merges unknown-feature-b branch (origin/unknown-feature-b) to dev branch (origin/dev) and close the pull request. 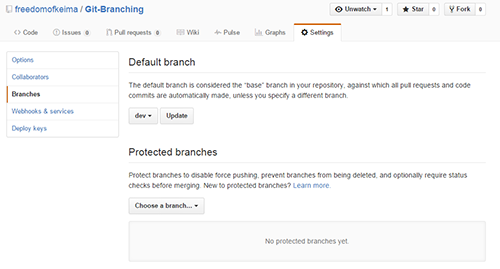 After merging, branch unknown-feature-b is deleted from origin. At this point, it should be impossible to have a conflict between dev branch with master branch, since dev should always reflect the newest state of your development. We will create a release version 1.0.0 with current HEAD in dev branch. At this point, some people prefer to delete the release-1.0.0 branch, while the others keep it for traceability purpose. Up until this point, you have learned 4 types of branching: master branch, dev branch, feature branches, and release branches (as a snapshot). We will proceed to the 5th type: hotfix branches. This branch is quite different from your typical feature branches because it needs master branch as its base. This branch serves as severe bug fixes in production environment. At this point, you will have 5 branches in your repository: master, dev, christmas-feature-a, release-1.0.0, and release-1.0.1. In addition, you will have 2 releases under your "releases" tab. 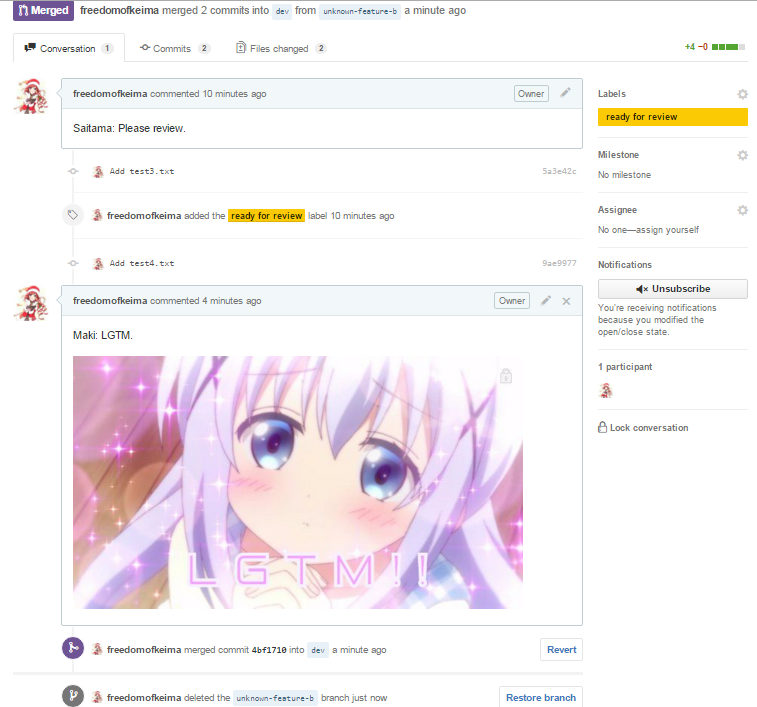 If Maki decides to continue her work, her changes are not tainted from other changes https://github.com/freedomofkeima/Git-Branching/pull/2. Finally, other people can review those features independently and merge those branches to dev branch after all tests are successfully passed. Additional note: Some people prefer to differentiate hotfix and release branches (they put the tag to hotfix branch, instead of creating a release branch). The others prefer not to store both of them in their repository. Feel free to correct me if I've written something wrong. Happy holiday!